Last night was NC Summer Blogger Buzz and I had so much fun! 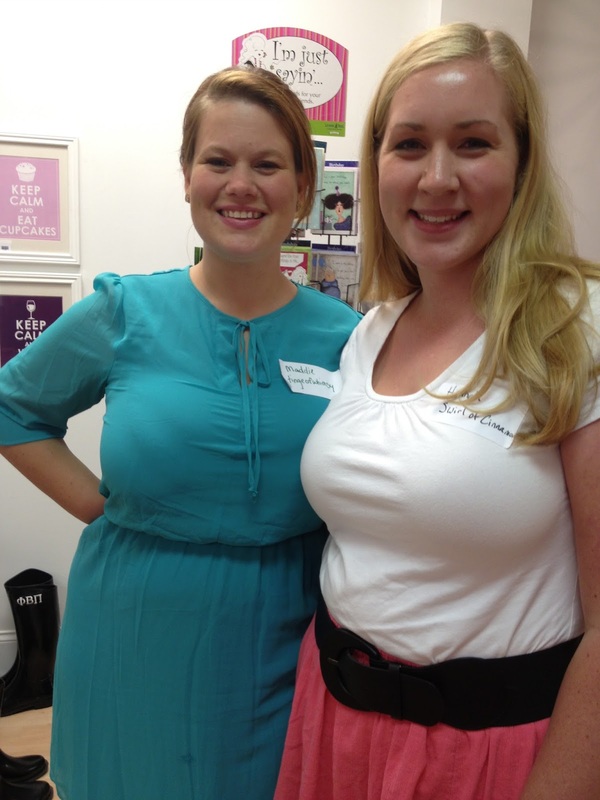 It was great to meet so many wonderful ladies! I am normally painfully shy but I was able to break out of my shell and be comfortable around wonderful women that have something in common with me. Blogs! I made fast friends with a few ladies including Maddie from The Whimsy One. I have really enjoyed getting to read her blog this morning and I have especially been drooling over her Whoopie Pies! I was able to sponsor some treats for the ladies to snack on while there. The recipe I will feature today seemed to be the most popular item, maybe because they are so darn cute! 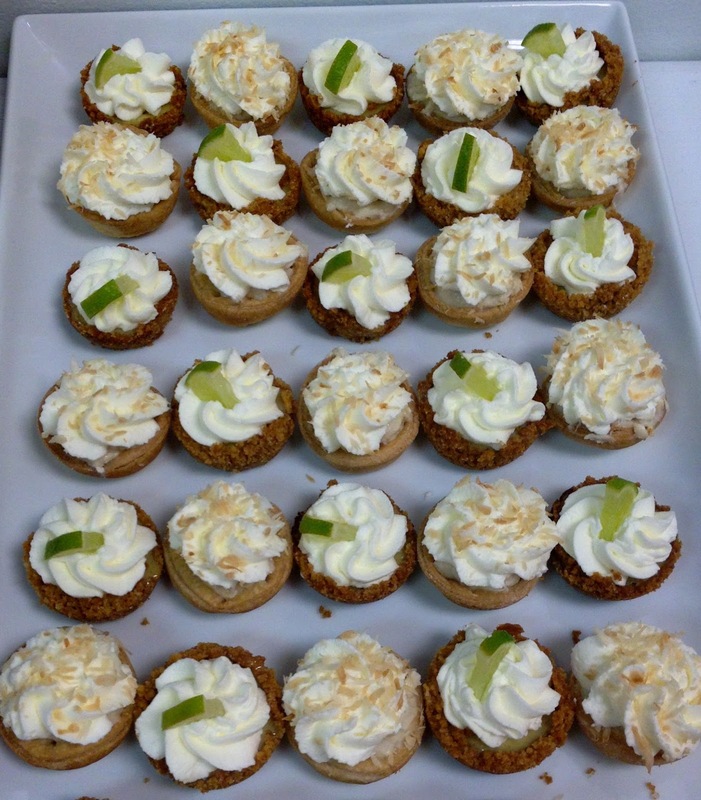 They are tasty key lime pies that are shrunk down to mini muffin size. 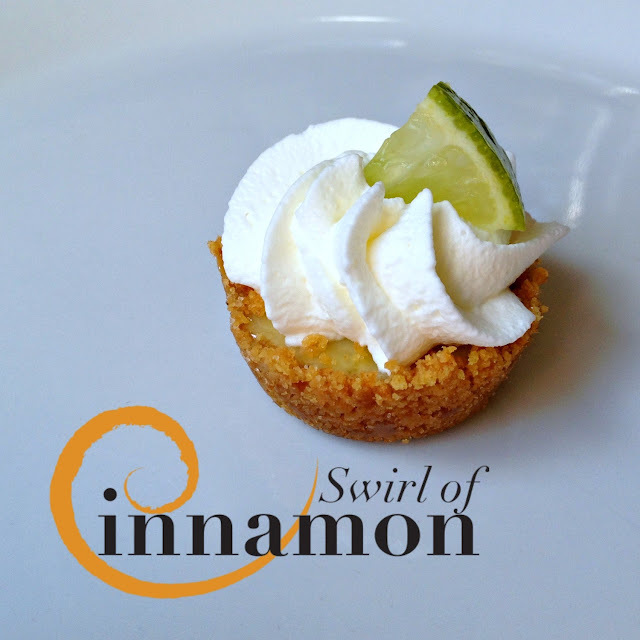 For some reason key lime pie becomes 10x better when it is bite sized– who knew! The crust is sweet and buttery and the key lime filling is tart but with the crust and the dollop of whipped cream on top it all balances out wonderfully. I hope you enjoy! Preheat oven to 375. Combine the graham cracker crumbs, melted butter and sugar in a bowl and mix well. All the crumbs should be moist but not sopping, add more melted butter if needed. Spoon mixture into mini muffin tins, you will need about 1 Tbsp per muffin cup. Press the crust into the tins to firmly cover the bottom and come up the sides, I recommend using a mini tart shaper like this one by Pampered Chef. It is not a necessity but it sure makes it easier! Once all tins are filled and pressed bake at 375 for about 5 minutes or until the crust is just golden. When you remove them from the oven you might notice that the crust has bubbled up at the bottom a little. Press this down with a spoon or the tart shaper. Reduce heat to 325. In a medium mixing bowl combine the eggs, sweetened condensed milk, lime juice and zest, whisking thoroughly. Spoon into the prepared crusts, the mixture will not rise so you can fill them almost until the top of the crust. Bake at 325 for about 8-12 minutes or until the inside has almost set. Allow to cool on the counter and then chill for at least an hour. Once chilled, whip the cream and 2 Tbsp sugar in a stand mixer or with a hand mixer until stiff. Pipe or spoon over chilled tarts and top with a small lime wedge. Refrigerate until ready to serve. I'm so glad you connected with Maddie....she is beyond fantastic! And so are you. These treats were out of this world amazing! Thank you, thank you! Thank you for hosting us! I had a great time and learned so much! Remember how I didn't bring any extra home with me? As I sit here reading this right now...I am kicking myself. These would be perfect for breakfast, right? It was so great meeting you on Friday! Those tartlets were delicious!! !